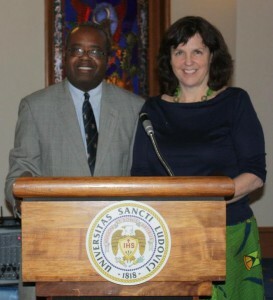 I was honored to speak at the 2013 Lynda Campbell Memorial Lecture at St. Louis, MO. My talk was “International Service that Really Serves.” It was the first time that I had done a full day on my international work. I used the videos from Ghana, Bolivia, Guatemala, and South Africa, but I also brought in the TEDtalks and other pieces that made me think deeper and continue to question myself to make sure the work is beneficial, sustainable, and capacity building. I was so impressed by the faculty there, the past presenters, and the people who came. Special thanks to Dr. Travis Threats, Pat Miller, and Danille Deitz, for making it happen. Thanks especially to Dr. Threats who can give up his day job as Professor and Chair to become a professional photographer. He took some amazing photos.